As the terminal of the 65 kilometer-long Li River cruise tour, Yangshuo has long been a mecca for backpackers since 1980 's. Crisscrossed with rivers and streams the Yangshuo area is embraced by Li River and Yulong River on the outskirts while the city is within the arms of the limestone peaks and hills. Yangshuo itself is becoming so famous that a popular idiom now says "Guilin 's mountains and water are the most magnificent under heaven. 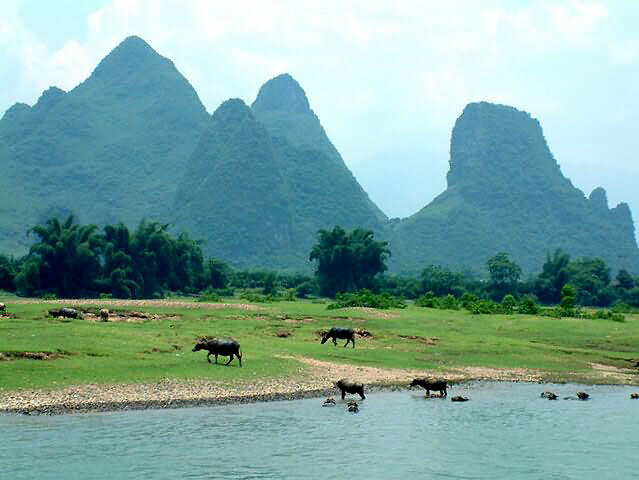 But Yangshuo 's are even better." This beautiful and sedate ancient city has a history of more than 1,000 years. However, it isn't a typical Chinese town. Yangshuo has a reputation as a tiny global village in Southern China. It is more like a vacation town, with an exotic blend of cultures where East meets West. 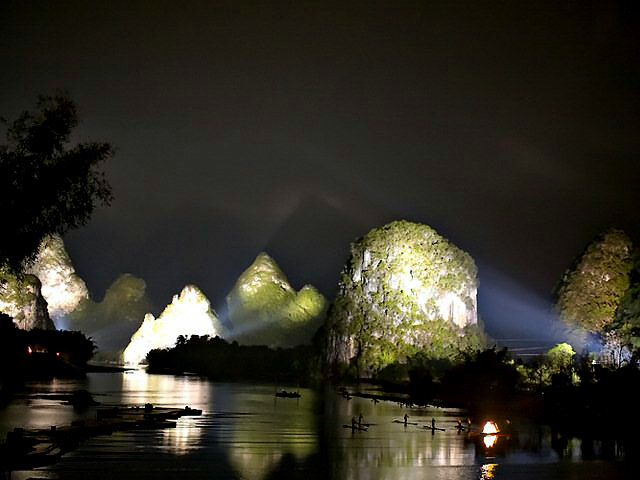 Many travelers use Yangshuo as a base to explore the Karst hills and rivers or checking out peculiar caves around. Renting a bike and throw yourself into the countryside with or without a guide, is one popular strategy. There is also a whole community of rock climbers enjoying hills and caves. Others may choose to just take it easy in the quaint cafes and bars on the West Street. This certainly isn't the whole story. In Yangshuo, there definitely is something for everyone. Situated in the heart of Yangshuo,West Street is an ancient street with a history of more than 1,400 years. It now attracts visitors for its unique mix of cultures. West Street has seen countless foreigners from all over the word and is reputed as "Foreigner 's Street". Visiting West Street, you will be overwhelmed by an array of Chinese traditional folk and amazing international elements. The 2000-m-long street has various bars, cafes, restaurants, hotels, art crafts and souvenirs stores, foreign language clubs and even Kufu schools. You may find some exquisite bars and cafes run by foreigners, decorated with bamboo rafts, fish baskets and wax-painted tablecloths. This street is an ideal place to eat, shop, entertain, study or just take a break. It is calm and peaceful in the morning, while trendy and modern in the evening. Do you watch a play in the theater of a natural environment? The unique performance of "Impression Liu Sanjie" will make you moved. This is the world largest natural theater which sets the waters of the Li River as its stage, with twelve mist shrouded hills and the heavens as its backdrop. Mist, moonlight, the hills and their inverted reflections in the water create the ever-changing natural background. Different weather or seasons will offer different experience for visitors. 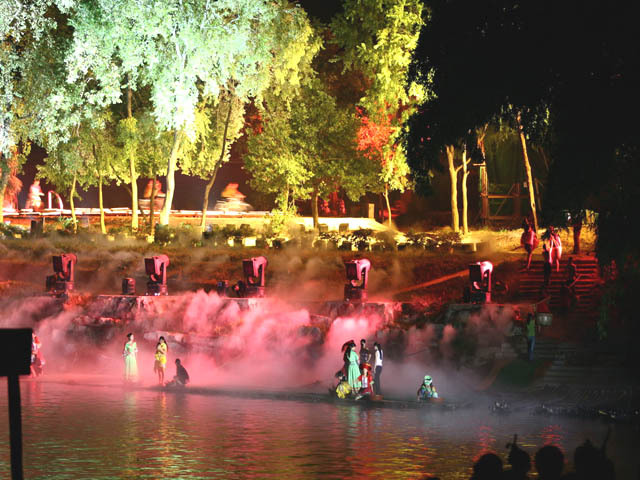 Its auditorium is housed on the islands of the river with the audience standing on the designed terraces, surrounded by green plants. The sound equipment here cannot be seen as it is in harmony with the natural environment. The valleys, the hills, the cool breeze and the gurgling streams are all elements contributing to the three-dimensional sound effect. This is really a new concept musical bringing nature as an integral part of its performers. Landscape background of the light Show Stunning scene of the light show.